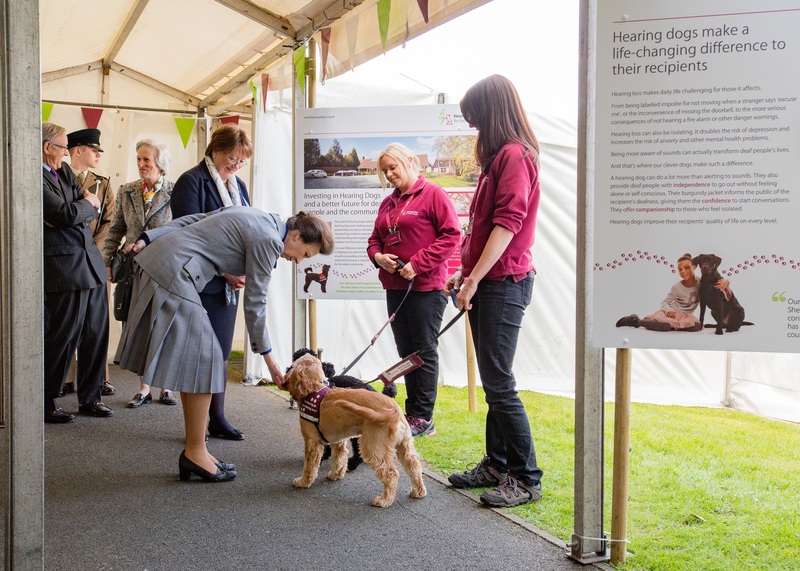 Buckinghamshire-based charity Hearing Dogs for Deaf People hosted their Royal Patron, The Princess Royal, for an afternoon of puppy-training demonstrations and to meet people who have had their lives transformed through the charity’s work. The purpose of the afternoon was for the charity’s Royal Patron, The Princess Royal, to launch a capital appeal to fund the charity’s new Welcome Centre. The new centre, which has been granted planning permission, has been designed specifically with the needs of deaf children and adults in mind, but also as a welcoming place for dog lovers and local residents and visitors to enjoy a meal with friends, a safe walk in the beautiful grounds, and to learn about the charity at the same time. Speaking at the event, Chief Executive of Hearing Dogs for Deaf People Michele Jennings said: "This new centre has been designed to meet the needs of deaf and disabled people and to be particularly welcoming to dog lovers and the local communities, all within a building that will be sympathetic to the beautiful Area of Outstanding Natural Beauty we are so fortunate to be based in." The Princess Royal visits @hearingdogs for Deaf People's Training Centre in Saunderton, near Princes Risborough, for an afternoon of puppy-training demonstrations and to meet people who have had their lives transformed through the charity's work. @hearingdogs train clever dogs to alert deaf people to important sounds such as the doorbell, telephone and fire alarm. Hearing Dogs for Deaf People is a Buckinghamshire-based Charity that trains clever dogs to alert deaf people to important sounds such as the doorbell, telephone and fire alarm. The Charity is celebrating its 35th anniversary in 2017 and has already trained over 2,240 accredited Hearing Dogs to transform the lives of deaf children and adults across the UK.